Walt Disney Animation Studio’s best post-Pixar feature film, Frozen employs the same musical theater or pop operatic structure on display in two of their finest female-centric Disney Renaissance era pictures (namely The Little Mermaid and Beauty and the Beast) to craft one of the House of Mouse’s most exquisite animated masterpieces so far. 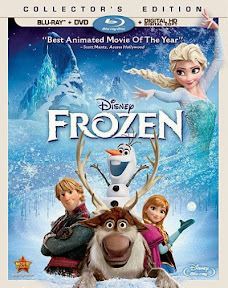 Written by Wreck It Ralph co-writer Jennifer Lee and directed by Lee alongside Surf’s Up and Tarzan helmer Chris Buck, Frozen is elegantly simple in its bare bones adaptation of Hans Christian Andersen’s The Snow Queen. While Frozen does incorporate a few of the requisite character archetypes and plot points straight out of Disney’s playbook of choice in the form of Christopher Vogler’s distillation of Joseph Campbell’s mythical hero’s journey, Lee does so carefully. Breathing new life into the three act quest paradigm, Lee rejects everything we’ve seen too many times before in the Disney filmography to create something that's as reassuringly familiar as it is refreshingly original, which is no small feat indeed. And it’s precisely this attitude to gamble on something different and modern rather than falling back on more of the same formulaic fare (that didn’t quite work in the recent past) that makes Frozen the studio’s riskiest and most game-changing endeavor to date. Months before Cate Blanchett’s Oscar winning speech championed more cinematic girl power, the smash success of Frozen reminded studio heads around the world of the old Field of Dreams adage that “if you build it, they will come,” meaning if you provide empowering, quality entertainment for girls and women, they will support it in droves. 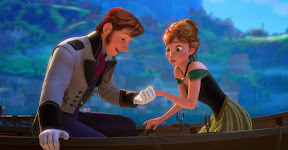 Daring to present us with a more realistic approach of the Disneyfied belief in love at first sight, Frozen took its role influencing young girls seriously. Challenging the fairy tale notion of fireworks in favor of using your head as well as your heart, Frozen advises falling in love with a whole human being rather than a picture-perfect image of a handsome prince. Additionally, Frozen avoids taking the easy way out by allowing the not one but two strong female (sister) heroines an opportunity to save themselves and each other when push comes to shove. Arguing that true love is more than merely romantic, throughout the film the women learn that their own loving relationship with each other as sisters and friends is a far greater bond than they ever could have imagined. While initially plans were made to follow Disney tradition in making only one of the two beautiful princesses good as Idina Menzel’s Elsa, who has the involuntary ability to turn objects into ice based on a strong emotional response, was slated to be the movie’s villain, wisely Lee and the three other scribes with whom she collaborated on the film’s overall plotline changed their mind. 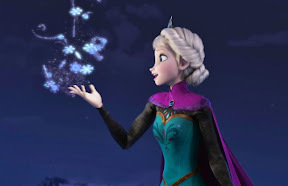 Recognizing the fact that Elsa’s “curse” makes her an allegorical outsider with whom anyone and everyone can instantly relate (from minorities and disabled individuals to anyone who has struggled with being different), suddenly her rallying cry to “Let It Go” in the film’s Oscar winning Best Original Song turns into a musical mantra for all viewers who have ever felt ostracized. Giving audience members the ability to vicariously let go of failures, mistakes or embarrassments (particularly in this era of social media and lives lived in the cyber bullying public eye) reminds filmgoers how powerfully cathartic and life-changing cinema can be. Stunning viewers not only with Menzel’s trademark vocal belt that fires through all of your home speakers in this subwoofer rocking Blu-ray but also the surprisingly musically gifted singing debut by Veronica Mars actress Kristen Bell, the film’s songwriters give the pair as well as the rest of the ensemble cast plenty of chances to shine in what has now become a bestselling soundtrack. A fast-paced and gorgeously produced work which garnered a Best Animated Film Oscar for its talented directors, now with its release on disc and digital download, Frozen takes its rightful place alongside studio greats from Snow White all the way up through Beauty and the Beast. Boasting a preview of the upcoming Blu-ray Diamond Edition of Sleeping Beauty, Frozen winds up showing feminists just how far the studio has come from churning out high quality yet fully man made animated classics wherein our heroine spoke roughly fifteen lines of dialogue before succumbing to a deep sleep to a picture written and co-directed by a woman with two female leads who are continually in control. Therefore it’s no wonder that, according to Entertainment Weekly, since its November 2013 release, Princesses Anna and Elsa have become the most popular destinations in the Disney parks. Drawing bigger crowds than Space Mountain and/or the Matterhorn, tourists regularly wait in line for over two hours simply to meet the women whose animated alter egos may help a new generation of girls “let it go,” as well as encourage them to stand up for themselves and each other instead of simply hoping that someday their prince will come.